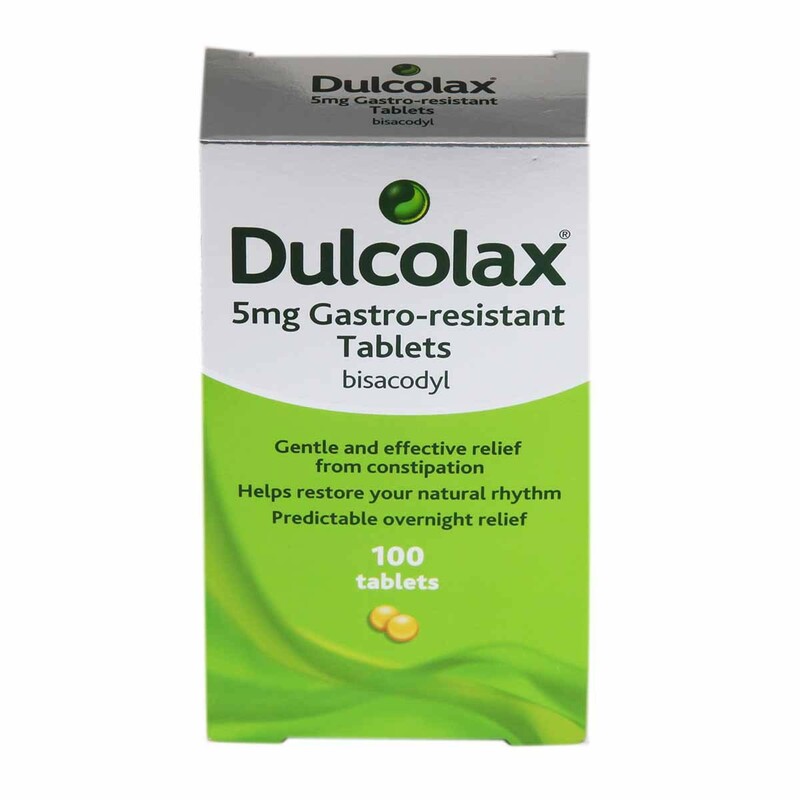 Dulcolax tablets (Bisacodyl) are trusted around the world as gentle, reliable and easy to take. Each small tablet contains a precisely measured amount of the active ingredient, Bisacodyl, to ensure that Dulcolax tablets are particularly predictable and reliable. Dulcolax tablets are ideal for people seeking overnight relief from constipation, since,6 to 12 hours after taking an individual dose, the colon is gently stimulated and constipation is relieved. Dulcolax Tablets have the special Dulcolax Comfort Coating, ensuring that the active ingredient is released right where it's needed: in the colon. The Dulcolax Comfort Coating resists the acidic digestive juices of the stomach and the environment of the small intestine. It dissolves only when it reaches an alkaline (non-acidic) environment: the colon. Each Tablet contains Bisacodyl 5mg. Also contains: lactose, maize starch, sucrose, glycerol, magnesium stearate, talc, acacia, white beeswax, shellac, carnauba wax, titanium dioxide (E171), yellow iron oxide (E172), methacrylic acid-methyl methacrylate copolymer, dibutyl phthalate,macrogol 6000. Adults and children over 10 years:take 1 or 2 tablets at night, or as directed by your doctor. If you have not used Ducolax before, start with 1 tablet and increase to 2 if necessary.Swallow tablets whole with water.Children under 10 years not recommended except on medical advice.Always read the label.Do not take milk or antacids within one hour of taking Dulcolax tablets. Caution: If laxatives are needed for more than 5 days in a row or if you persistent abdominal pain, consult your doctor.Do not take milk or antacids within one hour of taking Dulcolax tablets.Do not take if you have an intestinal obstruction, an inflammatory gastrointestinal disorder, or severe dehydration, or if you are pregnant, planning a pregnancy, or breast feeding. You should carefully read all product packaging and labels prior to use. 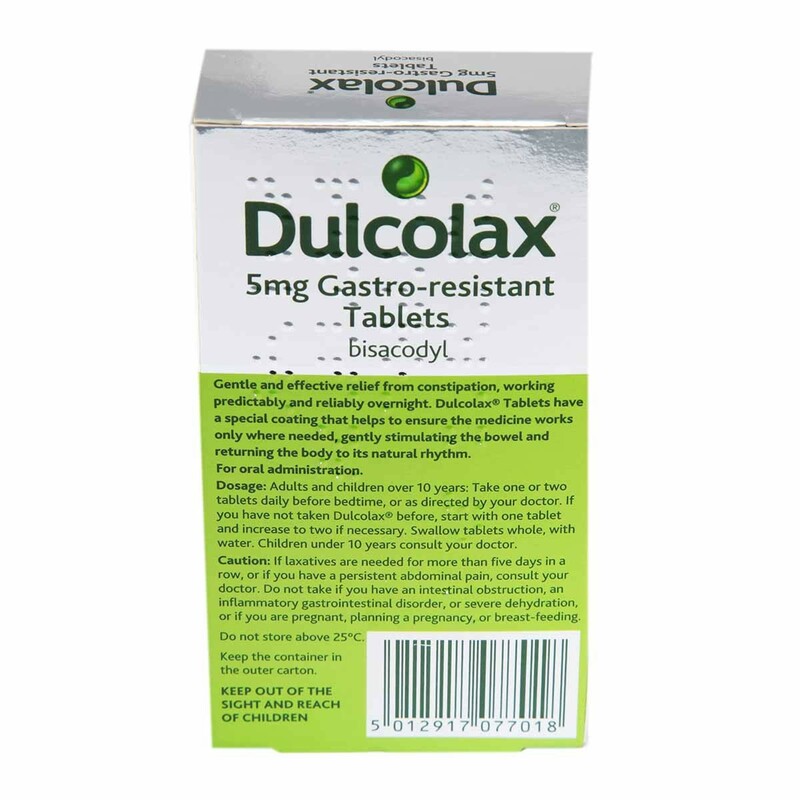 Thank you for your interest in Dulcolax 5mg Gastro- Resistant Tablets. Enter your email and we'll contact you as soon as it's available again.